Basil smells and tastes sweet, and it’s also highly nutritious. For example, 1/4 cup of chopped basil gives you 31% of your daily vitamin K needs – so it’s a great addition if you’re lacking in that vitamin. (Check out these vitamin K deficiency symptoms if you aren’t sure.) Now, basil seeds are emerging as one of the newest superfoods, and if you’re not into the taste of chia seeds, basil seeds can easily replace them or be used alongside them. Want to know some of the reported health benefits of basil seeds? Keep on reading. Basil seeds have traditionally been used in Ayurvedic and Chinese medicine; and while there isn’t a lot of research backing the various health claims for the seeds, the West is starting to catch on that they might be a healthy addition to one’s diet. The seeds that are used for eating come from the sweet basil plant, Ocimum basilicum. It also goes by the names great basil and Saint-Joseph’s-wort. This species is different from the holy basil plant, Ocimum tenuiflorum, known as tulsi. The leaves and oil of the holy basil plant have been utilized in Ayurvedic medicine for a host of purposes, but not typically the seeds. Sweet basil seeds and chia seeds are about the same size, but basil seeds are primarily black and tear-shaped. Chia seeds are a mottled grey and brown color with a more rounded shape. Like chia seeds, sweet basil seeds take on a gelatinous texture when soaked in water. Many Asian countries use sweet basil seeds to thicken drinks and as a health supplement. Basil seeds can be eaten in a variety of ways and can always be used to replace chia seeds in recipes. It’s best to soak basil seeds for at least a couple of hours before using them to ensure their digestive enzymes are fully released. Be careful putting them in drinks, though, especially beverages intended for children, as they could choke on the seeds. 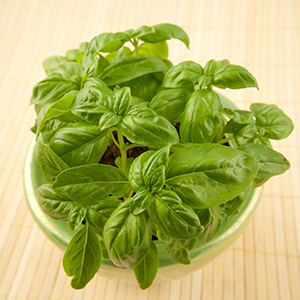 Want to know more about sweet basil? Check out another post of ours by clicking the previous link. And remember to let us know what you know about the health benefits of basil seeds in the comments below.